An exploding box is nowhere near as dangerous as it sounds! The name comes from the fact that the sides of the box cascade outwards when the box is opened - no other explosions are involved. This makes an unusual gift box or a lovely keepsake and rubber stamping is the perfect way to personalize and customize the box. The exploding box is very simple to vary and, once the basic principles are understood, the box is easy to create in any size. A template is not necessary as the base of the exploding box is created from three pieces of card that are the same shape but each piece is slightly smaller. This allows them to sit snuggly inside each other. If you would like a little help, however, a template is attached which will make creating this exploding box a little easier. To make the most from your paper or cardstock, print the template onto scrap paper and arrange this onto your best paper to make most efficient use of space. Click here for step by step project instructions. The base for the exploding box is made from three pieces of card, which although are of identical shape, each varies in size slightly from larger to small. This template is for the larger size. 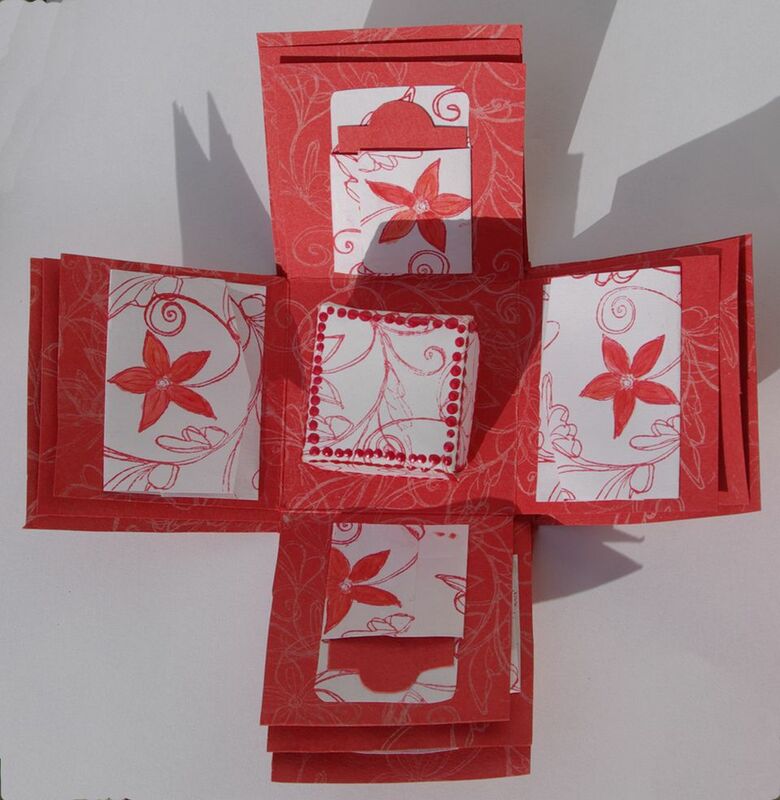 The base for the exploding box is made from three pieces of card, which although are of identical shape, each varies in size slightly from larger to small. This template is for the medium size. The base for the exploding box is made from three pieces of card, which although are of identical shape, each varies in size slightly from larger to small. This template is for the small size. This template is for the Lid of the exploding box. You'll find the other pieces of the previous pages. It is slightly larger than the base which allows the 'exploding' sides to be held snuggly before the lid is taken off. Trim the edges of the lid as required to make it the desired length. To print the template, simply click on the image above to open the full size version of the template. Then right click on that image and select 'Save Image' to save onto your computer. Print as required.